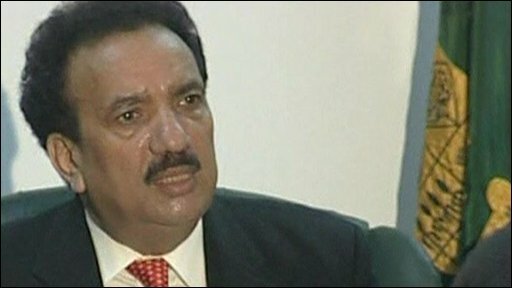 Interior Ministry chief Rehman Malik said that a number of suspects from the banned Lashkar-e-Taiba militant group had been held and may be prosecuted. India's foreign ministry described it as a "positive development". Tensions were high after Delhi said 10 gunmen from Pakistan were involved in November's attacks that killed 173. Pakistan denied any responsibility in the immediate aftermath of the attacks, but later admitted that the sole gunman captured alive was one of its citizens. On Thursday Mr Malik told a news conference that legal steps had begun against eight suspects which could lead to prosecutions. "Some part of the conspiracy has taken place in Pakistan. We have lodged an FIR [first information report] into the case," he told a news conference in Islamabad. He said six of the suspects "are now in custody" while two others remain at large. It is not clear when the suspects were arrested - Pakistan said in January that 71 suspects had been detained. Arrests began in early December. "The attackers left from Karachi on a boat hired from Balochistan [province]," Mr Malik said. "An e-mail claiming responsibility for the attack was sent by Zarrar Shah of the Lashkar-e-Taiba." Mr Malik named Hamad Amin, a Karachi resident currently in Pakistani custody as the mastermind behind the attacks. 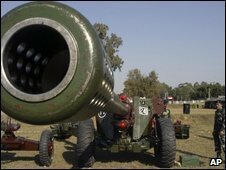 The BBC's Syed Shoaib Hasan in Islamabad says this is the first time the Pakistani authorities have acknowledged the full extent of the charges made by the Indian government. Our correspondent says it is also the first time a serving Pakistan government official has acknowledged that a foreign terror plot was hatched in Pakistan - an admission that could hold serious implications for the country's security establishment. India's foreign ministry welcomed Pakistan's admission. "We would expect that the government of Pakistan take credible steps to dismantle the infrastructure of terrorism in Pakistan," it added in a statement. There is genuine surprise in India at what is seen by some as a major turn-around by Pakistan, the BBC's Sanjoy Majumder in Delhi says. India has in the past consistently accused Pakistan of not doing enough to arrest those behind the attacks. Thursday's remarks by Mr Malik follow two months of rising tensions between India and Pakistan. The Indian government has demanded that Lashkar-e-Taiba leaders be extradited, while Pakistan has insisted any prosecutions would take place on its soil. Delhi has also suggested that what it calls Pakistani "state elements" were involved, something Islamabad has consistently denied. Islamabad also derided the contents of a dossier which Delhi said contained evidence to support its case. Officials said they had also shut several schools run by a charity linked to Lashkar-e-Taiba. 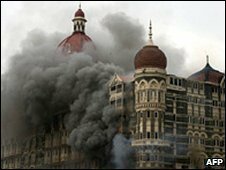 Earlier this week Pakistan said it wanted to prosecute suspects in the Mumbai attacks but needed more evidence from India to do so. Islamabad's decision to acknowledge links between Pakistan and the attacks on Mumbai is to some extent the result of pressure from the West and the fear of increasing tension with India, the BBC's defence and security correspondent Rob Watson says. And although Western countries are likely to view it as positive, they are generally very sceptical about the commitment of Pakistan's security establishment to get to grips with violent Islamic extremists based on Pakistani soil, he adds.